Welcome to the Aikido Orlando Dojo Gentle Aikido for Health and Defense! 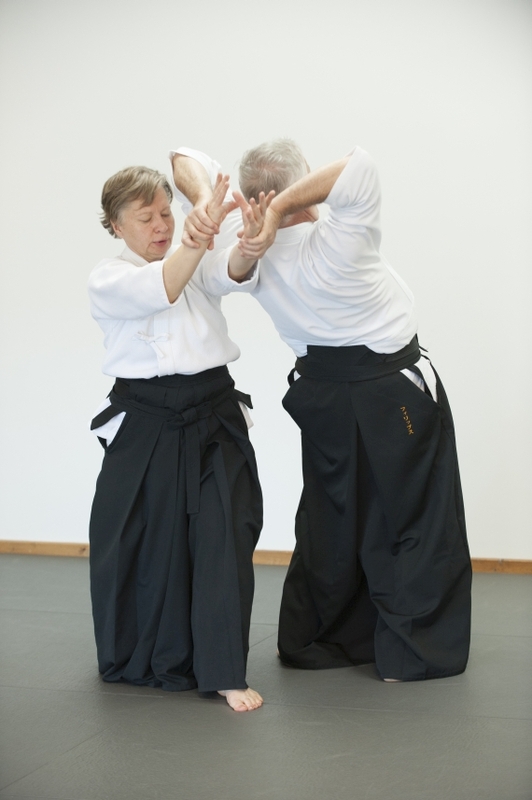 Gentlet Aikido Classes are designed specially for mature adults. With small modifications everybody at any age and condition can practice (with success) Aikido. O Sensei (Aikido founder) actively practiced Aikido to age 86! Health benefits of Aikido practice results in the steady improvement of physical and mental condition in daily life. Aikido training emphasize: proper breathing, balance and posture. Many Aikido exercises improve joints flexibility, range of motions and help preserve muscle mass and bone density. Regular training gradually builds endurance and strength. Exercise routine helps to manage healthy body weight. Psychological benefits of Aikido exercises have the effect of increasing body awareness and concentration. Aikido practice helps to focus on present tasks and can improve memory and coordination. Non-aggressive and non-competitive nature of Aikido can build self confidence and self esteem. Aikido training gradually leads to less antagonistic attitude toward any conflicts, emotional or physical. Practicing with different partners during Aikido classes builds strong community bonds, friendships, reduces daily stress and help to preserve or create social skills. Cooperative spirit in practice creates a friendly, welcoming atmosphere, in which people of different genders, ages, and physical capacities can come together to learn Aikido and help each other along the path to a greater understanding of its principles. Low Impact Aikido is practiced with a deliberately slow movement. According to the article published by Psychology Today magazine posted on their site on July 06, 2010 (Slow Movement with Awareness: Better than Exercise? ), how you move is as important as how much you move and there is mounting evidence that slow movement, with body sense awareness, has astounding health benefits by itself and in combination with regular exercise routines. The article lists studies that reported "...less pain, depression, and disability and reported greater overall improvement in quality of life..." or "...shown to relieve the symptoms of rheumatoid arthritis, including less pain and stress, more body awareness, and more confidence in moving..." accomplished by slow movement. At Aikido Orlando Dojo with a guidance from the instructot each mature adult student can judge his or her level of participation or a need to sit out or take a break. While we teach safe falls to those that wish to explore it, no kneeling, rolling or falling is required. If you are challenged by some form of functional deficit, such as, trouble with manual dexterity, sensory issues, poor range of motion we will work with you to help you explore Aikido within your level of abilities. The practice is primarily principle-based exercises; however the attacks, movements and techniques are martially sound and practical application will be demonstrated. For more information please call 407 284 9598. See you on the mat!! !